Your horticulturist Jeremy Pinke is obviously very passionate about his work and it's clearly evident this spring as things are blooming very well considering we had some record low temperatures this past winter. 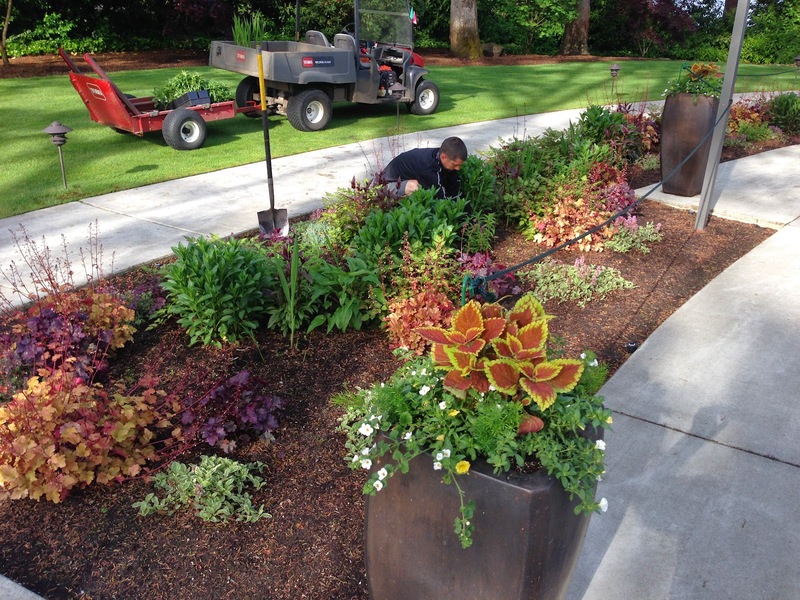 Jeremy has always done an excellent job managing the gardens around the Club which has been considerably challenging lately given all the changes around both the clubhouse and the golf course. 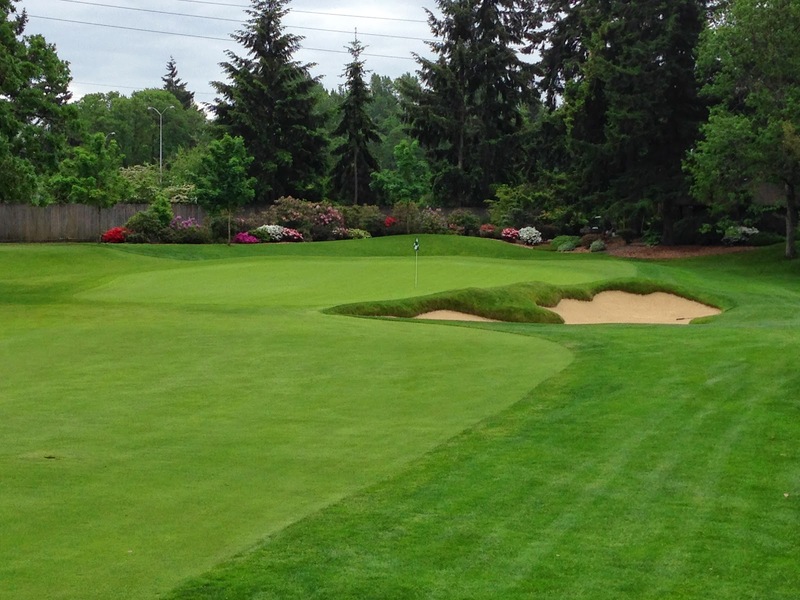 For example, in the above picture you see #12 green. This area has undergone several changes in the past few years. First was a complete change in 2010 when the sewer went through, and then just this past year a new teeing ground was added. Check out a picture of this area in 2009. Things have certainly changed and Jeremy Pinke (We just call him Pinky) has always adapted so well, making sure everything gets put back together and looking good for the golf season. Well he's super busy right now as all of the new plant material is coming in and he is hard at it working his magic. 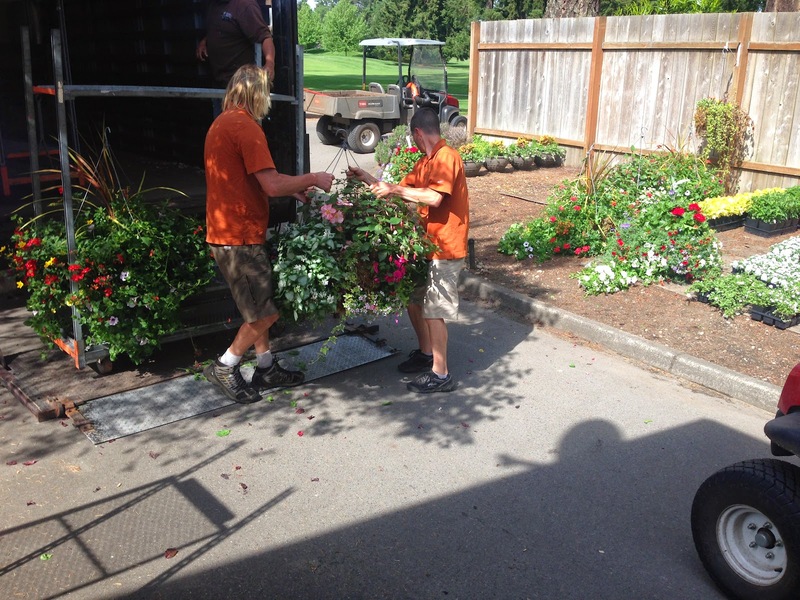 The hanging baskets are so big that it's a two man job unloading them. Above you see Jeremy's assistant Gabe helping him out. Gabe has been with us since 2010 and together these two guys are in charge of all the grounds off the golf course, in addition to those gardens that remain on the golf course. They just do an awesome job. If you don't think they have a huge responsibility, just go to the Club entrance and walk from there all the way around the parking lots to the pool down by the lake. It is a massive property for just 2 people to manage. I know this year Jeremy is trying out a lot of plants that have interesting foliage as opposed to blooms. I think it's looking great and since nice foliage should persist all season as opposed to blooms, it seems like a fun worthwhile experiment. 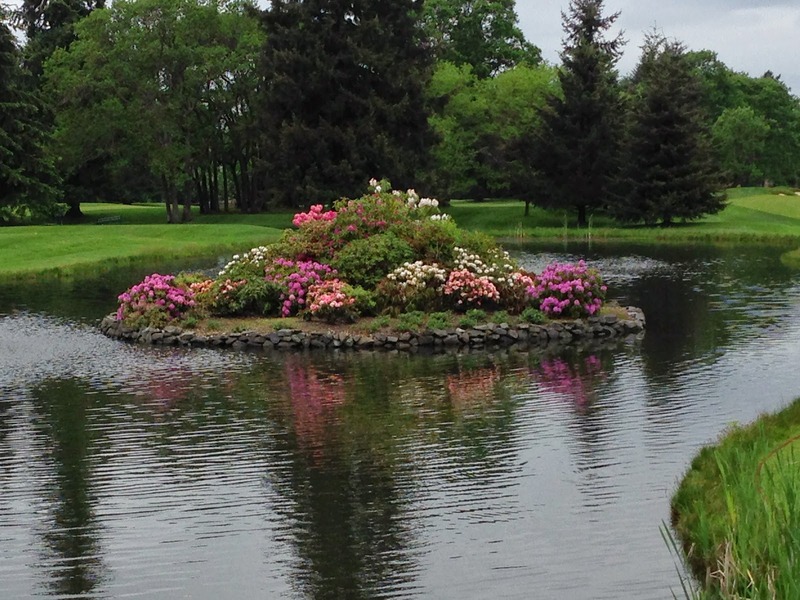 The 1894 island got a face-lift this spring. Jeremy is trying out dwarf boxwood this time. 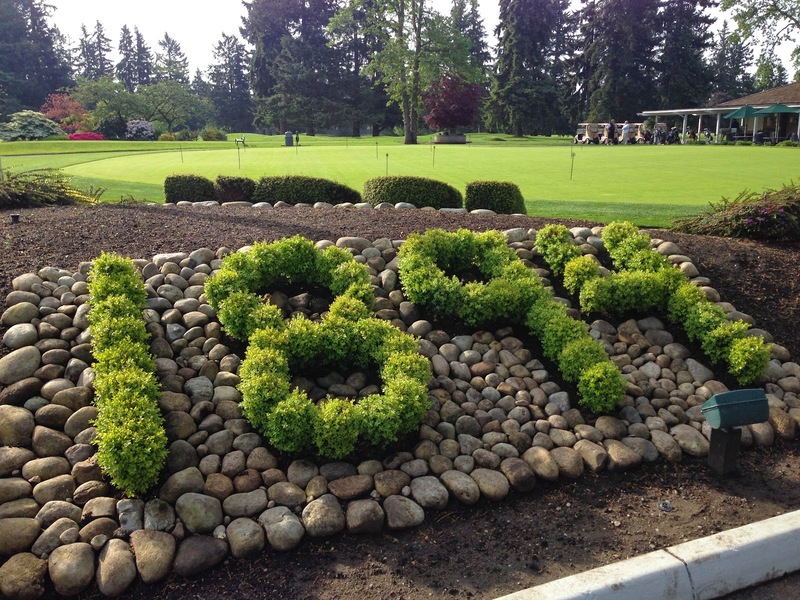 The original 1894 hedge was Ilex crenata or commonly called Japanese holly which is still the plant that makes up the 1894 facing the putting green. The restaurant side of the island which you see here is pretty shady and the holly never really did well. Hopefully the boxwood will be happy here. You might remember that Jeremy is also the one in charge of the island which underwent a major face-lift this past winter. Right now is the time to see it in full color, so if you like spring color, head down and check it out before it stops blooming. If you happen to see Jeremy and Gabe the next time your out at the Club, please take the time to tell them how much you appreciate the work they do. Lastly, if you haven't noticed yet, I'm sure you will the next time you walk down #1. 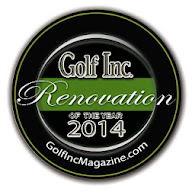 We have started the renovation of the practice hole. Master shaper Kip Kalbrenner is on site again and Nick Schaan our architect has laid out the plan. With these two guys on the job, you know it's going to be special. 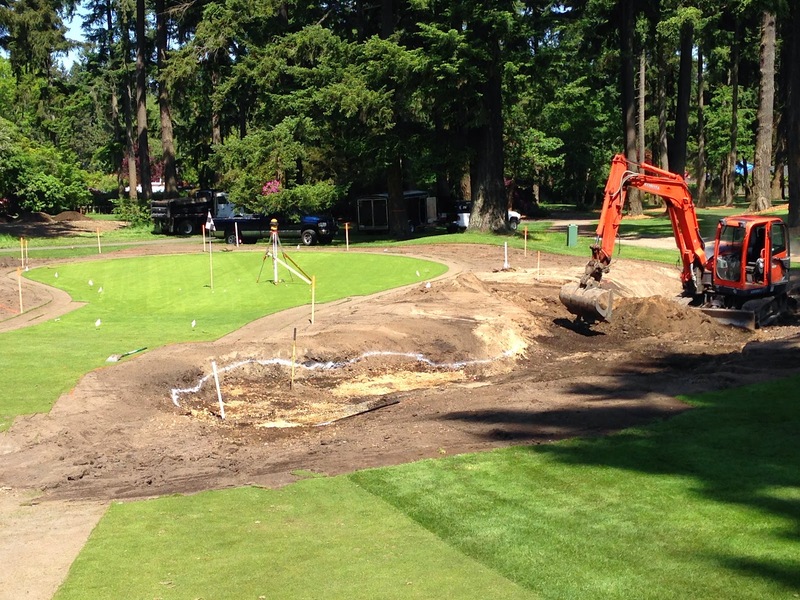 The green is getting expanded and there will be two bunkers once this project is finished. 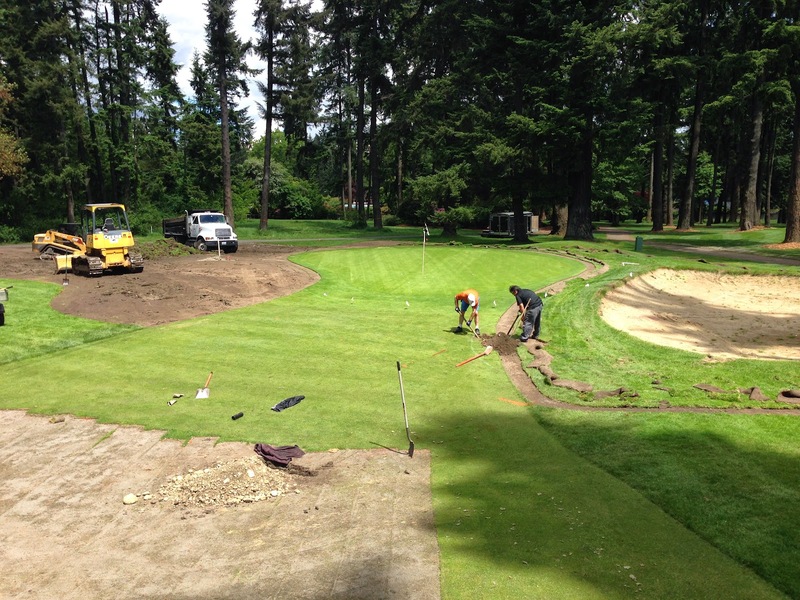 There won't be a short game practice area anywhere in Puget Sound that compares to the one at Tacoma once this project is completed. Stay tuned.